It feels like it's been an eternity since Arsenal has played, but that might be down to my own schedule: after Arsenal beat Hull on February 11, I was at work for the disaster in Munich, then went on vacation in Europe, where I missed the Sutton match aside from a ten-second portion I saw through the window of a pizzeria in Oslo. Then, with Southampton playing in the League Cup Final, Arsenal had last weekend off. So, what better way to dive back into the action than a must-win road game at Anfield! Arsenal have a game in hand on many clubs, though both Manchester clubs also have that game in hand, but the Gunners still find themselves 13 points back of Chelsea at the top of the table. More distressingly, they're three points back of Tottenham for second and -6 compared to their rivals in goal difference. This is the last truly big match for Arsenal until they host Manchester City in a month's time. They'll face Spurs and United in quick succession at the end of April and beginning of May. If they want an 836th consecutive season of Champions League football, they're going to have to start winning these games, even though historically Arsenal's trips to Anfield end drawn. Arsenal's biggest injury problems lie in the center at the moment; Mesut Özil is going to be touch-and-go, having missed practices through illness during this week. Meanwhile, Mohamed Elneny posted a picture of his foot in a boot on Instagram, so that's not a good sign. His ankle injury will keep him out for three weeks. Santi Cazorla's season is likely over, truly a devastating situation for the 32-year-old Spaniard who has had three surgeries on his Achilles. There could be returns on the cards for the likes of Aaron Ramsey, who hurt his calf against Watford, and Laurent Koscielny, whose hamstring injury against Bayern Munich turned a 1-1 game into a 5-1 loss in the amount of time it takes to say "Gabriel is not a world-class defender." We'll see if we get an appearance from Danny Welbeck, which would be more likely if Özil doesn't pass fit, because then Alex Iwobi will shift to the center while Welbeck will play a wing with Theo Walcott, with Alexis Sánchez starting up top. Then there's also Olivier Giroud and Lucas Pérez in contention as well. Can any of them play the holding role? Arsenal could really use a turn-around performance from Iwobi and Francis Coquelin if they want to keep their head above water in the top four race. Predicted XI: Čech, Bellerín, Koscielny, Mustafi, Monreal, Xhaka, Coquelin, Iwobi, Walcott, Özil, Alexis. After Wolves knocked Liverpool out of the FA Cup, Jürgen Klopp brought his side to Spain for a training camp during the weekend in which they did not have a fixture scheduled. From that trip, however, Daniel Sturridge left the camp through illness. He was not named in Liverpool's 18-man squad that lost to Leicester City on Monday, so he remains a doubt here. There are also strong doubts over Dejan Lovren, out with a knee problem, and captain Jordan Henderson, who has an ankle injury. Klopp has said about his captain that "It looks like he will not be ready for Arsenal, but I'm not sure, we will see." Marko Grujić is returning to training from a hamstring injury that has kept him out since November, but he's likely to be short of match fitness. Danny Ings's season is over with a knee injury and the young Oviemuno Ejaria is out with an ankle problem. Predicted XI: Mignolet, Clyne, Matip, Lucas, Milner, Wijnaldum, Can, Lallana, Coutinho, Firmino, Mané. It's hard to talk about form for Arsenal because they haven't played an English side from outside of the Conference since February 11, though since then, they got obliterated by Bayern Munich, made difficult work of fifth tier Sutton United, then had 11 days off. So, uhhhh, ¯\_(ツ)_/¯? Let's talk about a team whose form is worse, shall we? Liverpool were in second place after 19 matches, six points back of Chelsea for top spot. They had won four straight to end the 2016 calendar year and looked poised to challenges the Blues for the league title. Their form in 2017, across all competitions, is D-D-L-D-W-L-L-L-D-L-W-L. Two wins, four draws, six losses. The Reds crashed out of the League Cup to Southampton in the semifinals, lost in the FA Cup to Wolves at home, and have tumbled to fifth in the table. Their six point gap is now 14. Their record against other top teams, however, is surprisingly stellar: in this time span, they've beaten Spurs and drew Manchester United and Chelsea. They just have lost to the likes of Swansea, Wolves, Southampton twice, Hull, and Leicester. Liverpool traveled to the Emirates to open the season, conceded first, built a three-goal lead, then nearly allowed Arsenal to come all the way back. Arsenal were given a penalty in the first half, but Theo Walcott had his spot kick saved. Walcott did score moments later, but 32 minutes later, Liverpool were ahead 4-1. Alex Oxlade-Chamberlain pulled one back a minute later and Calum Chambers made it 4-3 in the 75th, but Arsenal never found an equalizer. Last year at Anfield, the sides played a slightly less bonkers 3-3 draw. 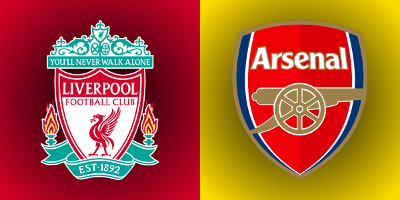 The sides traded goals through the opening quarter of the match, as Firmino twice put Liverpool ahead, with Arsenal equalizing within four and six minutes, respectively, first through Aaron Ramsey and second through Olivier Giroud. Giroud had what should have been the winner in the 55th minute, but substitute Joe Allen scored in injury time to rescue a point for the Reds. It was the second consecutive season in which Arsenal conceded a late equalizer to draw at Anfield. So, if you're keeping count at home, that's 13 goals between these two teams in their last two league fixtures. Even with the opening day loss, Arsenal have only lost three of their last 19 competitive fixtures against Liverpool across all competitions. 11 of their last 23 meetings have ended drawn. The referee is West Yorkshire-based Robert Madley. Madley has earned a number of high profile appointments this season, which I would venture even includes his most recent match, Tuesday's top of the table Championship clash between Brighton and Newcastle. Madley gave Brighton a controversial penalty early in the match, but Newcastle scored twice late to undo that damage. As for some of Madley's other big matches this year, he worked Liverpool's trip to Tottenham in August and Spurs's trip to Old Trafford in December. Arsenal have won both of their fixtures with Madley in the middle this season, though they left them both late; Madley worked the 2-1 win over Southampton in September, in which he gave the Gunners a late penalty, as well as the 2-1 FA Cup win at Preston, in which second half goals from Aaron Ramsey and Olivier Giroud spared Arsenal's blushes. Liverpool's record with Madley this year is much worse: that aforementioned trip to White Hart Lane ended 1-1, but he also worked their dramatic 4-3 loss at Bournemouth in December. All-time, Arsenal have a record of five wins, one loss, and one draw with Madley, though the draw was a League Cup tie at West Brom that ended in a penalty shootout win, so classify that however you like. The lone loss came to Swansea last March, a year ago yesterday. Madley has worked six Liverpool league matches and the Reds have only won one of them, but that was a 4-0 over rival Everton last April. John Painting is a contributing writer to the Modern Gooner and a science fiction novel. You can follow him on Twitter @zorrocat for lasers and aliens.